The twin spans over the Chesapeake Bay. 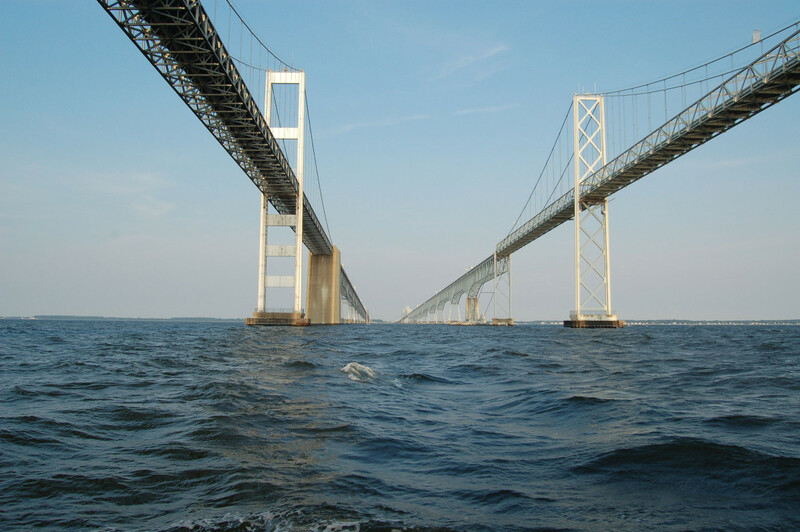 It is clear to any reasonable person that the existing Chesapeake Bay Bridges must ultimately be expanded or replaced, for a number of reasons. Construction of the existing bridges: First, the bridges are old. The initial two-lane span was built in 1952; the three-lane span, in 1973. Although they are well-maintained, they won’t last forever. Moreover, the unique construction of the two 4.2-mile spans creates inherent problems. The first span was built with no shoulders and narrow lanes. In 1973, the second span was built with three lanes, setting up the unusual problem of having to run one of the lanes in reverse (contra-flow) whenever traffic traveling east is significantly heavier. This requires one-third of the east-bound traffic to drive on a narrow, outside lane, facing oncoming traffic just feet away on the left, and a harrowing drop down to the Chesapeake Bay on the right. Each year, the Maryland Transportation Authority (MdTA), which owns and operates the bridge, must provide “drive-overs” to thousands of travelers who are too terrified to drive themselves. The existing bridge also lacks the facility to allow for anyone to walk or bicycle across the bridge. Capacity of the existing bridge: Ocean City is not the only reason people use the Bay Bridge. The Eastern Shore of Maryland comprises more than one-third of the land area of the State of Maryland, and accounts for nine of the state’s 24 jurisdictions. The Bay Bridge provides the only viable access to this region. According to the study completed by the MdTA last year, the bridge will have outgrown its existing capacity by 2040. At that time, summer backups could extend up to 13 miles every day of the week for travelers going eastbound, toward the shore. Significant backups would also occur for westbound traffic. Even during the non-summer months mile-long back-ups will occur every weekend for people going eastbound. Even so, 2040 is only 23 years away, and plans for any expansion or bridge replacement are not likely to be ready by then. One other issue to consider is that, the narrow lanes of the existing bridge can affect the capacity of the bridge rather significantly. Storms and high winds create problems often require closing the “contra-flow” lane, which can create a multi-mile back up on Friday evenings. Winds may also limit truck access to the bridge, and on rare occasions, require shutting down the entire bridge. Rascovar’s argument that by reducing tolls, the governor has “foreclosed” raising funds for a new bridge is just plain silly. Tolls collected today would be used for projects being planned or built today. Projections for beginning serious work on the Bay Bridge are many years in the future. When the time is right, the MdTA will begin to accumulate more bonding capacity. It might even be possible to get the bondholders to agree to a separate fund to be set aside specifically for the Bay Bridge. When we do look at toll increases in the future, however, there are better and smarter ways to do it. First, the Bay Bridge will become EZ-Pass, only, like the ICC, the Intercounty Connector. Not only would this help alleviate congestion, it would allow for congestion-pricing in the summer months. Peak summer driving times should be priced at the highest levels. This would place the burden on users, and would also help to smooth out the traffic flow and speed up drive times to and from the beach. Expanding the Bay Bridge will, as Mr. Rascovar says, be costly. Estimates for the various “build” options range from $3.89 billion to $6.85 billion. What he does not say, however, is that doing nothing (the “no build” option) will cost $3.25 billion, just to provide maintenance and rehabilitation. Thus the actual cost to provide the best and most expensive option would cost an additional $3.6 billion, not double that. Finally, Mr. Rascovar implies that the state could have better spent the potential billions it will take to expand the Bay Bridge on the Baltimore City Red Line that Gov. Hogan killed. The Red Line rail transit project was a bad idea back in 2004 when I was deputy secretary of transportation, and remained so until Gov. Hogan killed it last year. The state spent millions of dollars over the past 12 years because it was politically incorrect to oppose the project. Gov. Hogan made the courageous decision to kill it, and has suffered political consequences, such as the legislature’s effort to take control of transportation planning, embodied in the bill that became law this year. It’s not just the cost that makes rail transit projects of questionable value. It is the cost per person served. I have spent hundreds of hours studying the impact on congestion of building rail transit versus building road capacity. There is a place for all forms of transportation, but the myth that building mass transit projects will alleviate congestion better than expanding road capacity is simply not true. 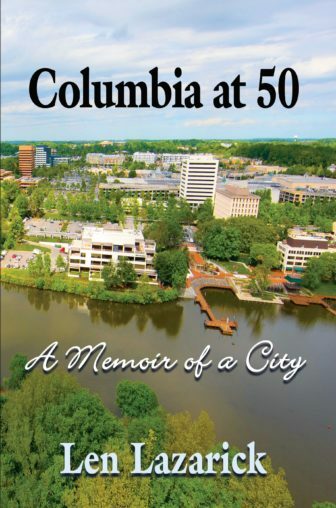 Experience in places like Seattle, Washington and Montgomery County, Maryland have shown over as many as 50 years that regardless of how actively you build and promote any form of commuting that does not involve driving a car, the percent of people who use it remains around 10%. The Bay Bridge currently serves millions of drivers a year – and at least 10 times more people, statistically, than any transit project in Maryland. But the initial cost of transit projects is not as significant as the massive operating subsidies they require, year after year. In Maryland, the worst example is the light rail which earns only 19% of its operating fees (despite the law requiring it to earn at least 35%). Even the vaunted Metro system in D.C. fails to earn enough to cover its operating expenses – leading to the serious maintenance issues that the system currently faces. On the other hand, highways in Maryland do not require any subsidy. “On a state-by-state basis the subsidies range from 2.6 cents per passenger-mile in Alaska to minus 0.6 cents in Maryland.” We are one of nine states that where “highway Users pay more fees than the states actually spend on roads,” according to an article by Randal O’Toole. Of the funds generated by the state’s gas tax and motor vehicle fees, only 30% is spent on road building and maintenance while 57% is spent on transit, according to federal figures. Add to all of these generic issues with transit, the Baltimore Red Line project also faced opposition from the community. All things considered, beginning the process to expand or replace the Chesapeake Bay Bridge before we reach a crisis is a prudent and wise decision by Gov. Hogan. The bridge’s “end of life” date is estimated to be 2065, some 49 years in the future. But as anyone familiar with the InterCounty Connector knows, 50 years is just about the time it takes to get a project of this magnitude done. Delegate Trent Kittleman, R-Carroll and Howard, was deputy secretary of transportation and executive secretary of the Maryland Transportation Authority in the Ehrlich Administration.